What are your cards worth? Click the logo above to visit Beckett.com and find out -- or pick up one of our magazines at your local bookstore or card shop. Are you a fan of graded cards? 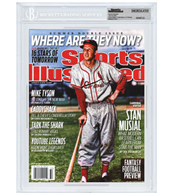 Have you heard about SI Uncirculated? Click the image above for more information. Have you heard about Free Stuff Friday? Be here every Friday for the chance to win some sweet sports cards and memorabilia just for answering trivia and card questions. Is it Friday? If so, scroll down for this week's contests. Pittsburgh Steelers DB Troy Polamalu — and his hair — returns to McFarlane Toys’ 21st series of SportsPicks, the company’s popular 6-inch vinyl action figures. It’s not Polamalu’s first figure — but perhaps this one showcases his famous mane the best. He previously appeared in Series 14 and in a Super Bowl XL two-pack, while a Steelers two-pack of Polamalu with Hines Ward is set to arrive in August. His latest figure is scheduled to arrive in October with that series also including debut figures for six players. A sneak peek with freshly released images is below. The Cutler figure is also one of his first items showing him with his new team, while the Manning is the fourth release for the star QB — not including his forthcoming collegiate figure. Chris Olds has collected sports cards and memorabilia since 1987. Before coming to Beckett Media, he wrote about the hobby for the Orlando Sentinel on his blog, SportsStuff, and for the San Antonio Express-News and The Tuscaloosa (Ala.) News. Do you have a comment, question or idea? Send e-mail to him at colds@beckett.com.